The fetal brain is sensitive to a variety of teratogens, including ethanol. We showed previously that ethanol induced mitosis and stem cell maturation, but not death, in fetal cerebral cortex-derived progenitors. We tested the hypothesis that micro-RNAs (miRNAs) could mediate the teratogenic effects of ethanol in a fetal mouse cerebral cortex-derived neurosphere culture model. Ethanol, at a level attained by alcoholics, significantly suppressed the expression of four miRNAs, miR-21, -335, -9, and -153, whereas a lower ethanol concentration, attainable during social drinking, induced miR-335 expression. A GABAA receptor-dependent mechanism mediated miR-21, but not miR-335 suppression, suggesting that divergent mechanisms regulate ethanol-sensitive miRNAs. 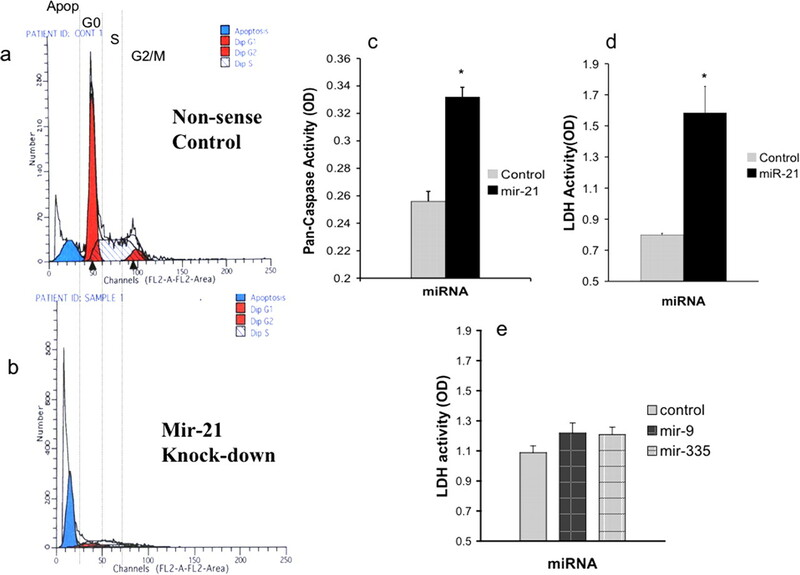 Antisense-mediated suppression of miR-21 expression resulted in apoptosis, suggesting that miR-21 is an antiapoptotic factor. 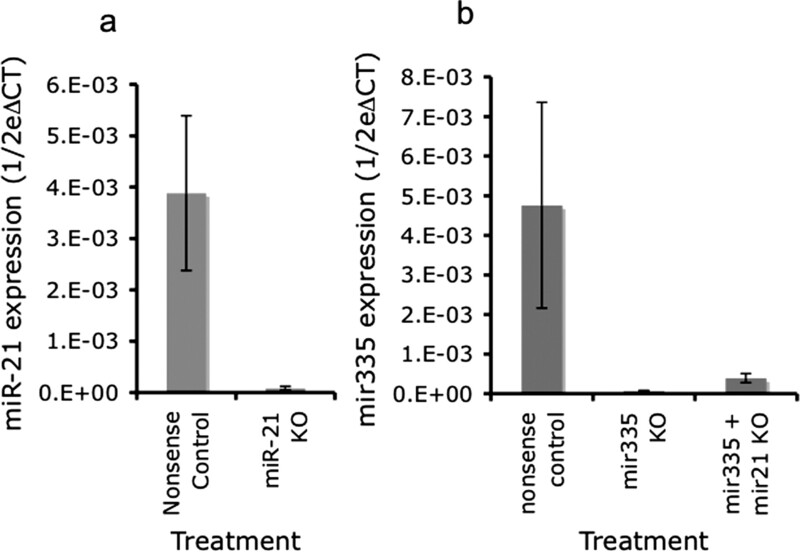 miR-335 knockdown promoted cell proliferation and prevented death induced by concurrently suppressing miR-21, indicating that miR-335 is a proapoptotic, antimitogenic factor whose actions are antagonistic to miR-21. Computational analyses identified two genes, Jagged-1, a Notch-receptor ligand, and embryonic-lethal abnormal vision, Drosophila-like 2 (ELAVL2), a brain-specific regulator of RNA stability, as presumptive targets of three of four ethanol-sensitive micro-RNAs. Combined knockdown of miR-335, -21, and -153 significantly increased Jagged-1 mRNA. Furthermore, ethanol induced both Jagged-1 and ELAVL2 mRNA. The collective suppression of micro-RNAs is consistent with ethanol induction of cell cycle and neuroepithelial maturation in the absence of apoptosis. These data identify a role for micro-RNAs as epigenetic intermediaries, which permit teratogens to shape complex, divergent developmental processes, and additionally demonstrate that coordinately regulated miRNAs exhibit both functional synergy and antagonism toward each other. The fetal ventricular (VZ) and subventricular (SVZ) zones exhibit enormous mitotic activity for a restricted developmental period to generate the neurons of the cortical plate (Rakic, 1988; Takahashi et al., 1999; Yumiko and Fujio, 2002; Noctor et al., 2004). The tremendous growth in brain size during this period of neurogenesis is accompanied by enhanced sensitivity to the teratogenic actions of a wide array of environmental agents and drugs of abuse (Clarren et al., 1978; Watson et al., 1999; Yanai et al., 2004; Petersen et al., 2006). Ethanol is a prototypic teratogen. Heavy ethanol consumption during pregnancy can lead to a persistent and stereotypic constellation of neural and other deficits, collectively termed fetal alcohol spectrum disorders (Jones and Smith, 1975; Streissguth and O'Malley, 2000; Sokol et al., 2003; Loock et al., 2005). The severe end of the continuum [i.e., fetal alcohol syndrome (Jones and Smith, 1975)] is characterized by significant mental retardation, accompanied by features including microencephaly, diminution of cortical gray matter, loss of interhemispheric communicating tracts, and the presence of neuronal heterotopias (Clarren et al., 1978; Clarren, 1986; Riley and McGee, 2005). Using an in vitro model for the second-trimester cerebral cortical neuroepithelium, we showed that, surprisingly, ethanol does not induce cell death (Santillano et al., 2005; Prock and Miranda, 2007). Rather, ethanol induces cell proliferation, while depleting the neural epithelium of ABCG2, c-kit, Sca-1, and CD133-positive stem-cell populations (Santillano et al., 2005). These data indicate that ethanol drives premature stem- to blast-cell maturation within the embryonic cortical epithelium. An important question is what biological control processes underlie the teratogen-mediated maturation of neural stem cells? Micro-RNAs (miRNAs) are 18- to 25-nucleotide-long noncoding RNA molecules that are important regulators of mRNA transcript stability (Denli and Hannon, 2003) and gene translation (Ambros, 2001). The human genome is predicted to contain ∼800 miRNAs (Bentwich et al., 2005). Although relatively few in number, these miRNAs are predicted to control a large proportion of the tissue- and cell-specific transcriptome (Krek et al., 2005; Lim et al., 2005), thereby regulating important biological processes, including mitosis, tissue-specific differentiation, and death (Croce and Calin, 2005). Some miRNAs maintain the pluripotent state of embryonic stem cells (Houbaviy et al., 2003), whereas others delay neuronal maturation (Krichevsky et al., 2003) or promote neuronal differentiation by suppressing the expression of non-neuronal mRNA transcripts (Conaco et al., 2006). Consequently, a teratogen that targets even a few miRNAs is likely to disproportionately influence development. As a first step to identify candidate miRNAs that mediate the teratogenesis of ethanol, we maintained gestational day 12.5 (GD12.5) fetal mouse cerebral cortex-derived neuroepithelial cells as nonadherent neurospheres, cultured in defined control or ethanol-supplemented medium. We present data showing for the first time, to our knowledge, that miRNA expression is selectively sensitive to a teratogen, ethanol. Furthermore, we also present novel evidence showing that ethanol-sensitive miRNAs exhibit synergistic as well as antagonistic actions in regulating the survival, proliferation, and expression of maturation-associated genes in fetal cortical neuroepithelial cells. Animals were maintained in the animal housing facility at Texas A&M Health Sciences Center, College of Medicine. All animal procedures were approved by the University Laboratory Animal Care Committee. Neural precursors were obtained from the dorsal telencephalic vesicles (the structural precursor of the cerebral isocortical projection neurons) of GD12.5 C57BL/6 mouse fetuses according to previously published protocols (Santillano et al., 2005; Camarillo et al., 2007; Prock and Miranda, 2007). Care was taken to eliminate the surrounding meningeal tissue, as well as tissue precursors to the hippocampus and the underlying striatum. Precursor cultures were established at an initial density of 106 cells in serum-free mitogenic media (DMEM/F12 (catalog#11330-032; Invitrogen, Eugene, OR), 20 ng/ml bFGF (basic fibroblast growth factor; catalog #13256-029; Invitrogen), 20 ng/ml hEGF human epidermal growth factor; catalog #53003-018; Invitrogen), 0.15 ng/ml LIF (leukemia inhibitory factor; catalog #L200; Alomone Labs, Jerusalem, Israel), ITS-X (insulin-transferrin-selenium-X) supplement (catalog #51500-056; Invitrogen), 0.85 Us/ml heparin (catalog #15077-019; Invitrogen), and 20 nm progesterone (catalog #P6149; Sigma, St. Louis, MO). Neurosphere cultures are a well established model that replicates the in vivo development and maturation of neuroepithelial stem and progenitor cells (Ostenfeld and Svendsen, 2004). We showed previously that cortical neuroepithelial cells maintained as neurosphere cultures, express a variety of stem and progenitor markers (nestin, ABCG2, Sca-1, c-kit, and CD133) (Santillano et al., 2005), but differentiate readily into multipolar neurons after the withdrawal of mitogenic factors and addition of extracellular matrix (Camarillo et al., 2007). Neurosphere-derived neurons express similar functional properties to neurons derived from in vivo models (Pagani et al., 2006). Cortical neurosphere cultures containing ∼2 million cells were assigned to either a control, or an ethanol-treated group doses ranging from 60 mg/dl (13 mm) to 320 mg/dl (70 mm), and treated for 24 h (to identify immediate effects of ethanol) or 5 d (to identify tissue adaptations to ethanol). Actual ethanol concentration in the culture medium was measured by gas chromatography. The particular doses of ethanol were chosen to reflect levels within ranges attainable during episodes of social drinking (60 mg/dl) or in chronic alcoholics (320 mg/dl) (Adachi et al., 1991). Furthermore, ethanol concentrations used in this study are expected to reflect levels actually attained by a fetus after maternal exposure (Gottesfeld et al., 1990). All experiments were performed with neurosphere cultures that were passaged <15 times. Additionally, cultures were exposed to methanol at 320 md/dl for 5 d. Because the GABA type-A (GABAA) receptor mediates many of ethanol's actions (Ma et al., 2001; Kalluri and Ticku, 2002; Abe et al., 2004), and functional GABAA receptors are present in fetal VZ neuroepithelial cells (Owens et al., 1999; Maric et al., 2001), we also used the GABAA antagonist picrotoxin (at 100 μm) (Nakamura et al., 2007), to block the effects of ethanol in some experiments. In control experiments, neurosphere cultures were exposed to picrotoxin by itself (at 100 μm) for 5 d to mimic the duration of ethanol exposure. miRNA fractions were isolated from cultured cells using mirVana miRNA Isolation Kit (Ambion, Austin, TX) according to the manufacturer's protocol. Purified miRNAs samples were quantified using the NanoDrop ND-1000 UV-Vis Spectrophotometer (NanoDrop Technologies, Wilmington, DE). miRNA expression at genome level was studied using micro-RNA microarrays (supplied by the Neuroscience Gene Expression laboratory, Rutgers University, Piscataway, NJ), containing probes for 845 mature miRNAs from five species (Goff et al., 2005). miRNA samples were labeled with the Array900 miRNA-labeling and detection kit (Genispehere, Hatfiled, PA), and arrays were hybridized according to the manufacturers protocol. A total of five independent sample pairs were hybridized to five independent arrays. Additionally, a dye-flip experiment was performed on one pair of samples to estimate systematic dye bias. After hybridization, arrays were scanned using a GenePix 400B scanner (Molecular Devices, Union City, CA), and the scanner gain and sensitivity was set so that the overall ratio of Cy3 to Cy5 intensity across the array was set at 1. Median spot intensities were determined using GenePix 4.0 (Molecular Devices). Array features that were irrelevant to the analysis, including blank features, Cy3 control spots, and miRNA probe features for all species except mouse, were removed before additional analysis. We further eliminated genes classified as “undetected,” based on a univariate mixture modeling and Bayesian statistical modeling algorithm (Asyali et al., 2004; Asyali and Alci, 2005). The data were analyzed further using GeneSifter (VizX Labs, Seattle, WA). Because a minority of sampled miRNAs (84 of 218) were identified as “expressed” by the mixture-modeling algorithm, and because of the a priori possibility that ethanol could globally regulate miRNA expression, we did not further normalize the data. Spot intensity data were log-transformed, and analyzed using t tests with Benjamini and Hochberg corrections for multiple comparisons. We validated our microarray data with real-time reverse transcription (RT)-PCR analyses for miRNAs, based on the protocol described by Schmittgen et al. (2004), and an SYBR green-based amplification detection, using a MyiQ single-color real-time PCR detection system (Bio-Rad, Hercules, CA). Random hexamers were used for reverse transcription of miRNAs using the Thermoscript RT kit (Invitrogen) with 500 ng of miRNA sample (primer sequences were as reported by Jiang et al. (2005). For analysis of gene expression, mRNA was reverse-transcribed into cDNA using Superscript III (Invitrogen), with 2 μg of mRNA sample as a template. Primers to Jag-1 (Jagged-1; forward primer in exon-13, 5′-AAAGACCACTGCCGTACCAC-3′; reverse primer in exon-16, 5′-TTCCTTTCCAGCCATTTTTG-3′; efficiency 112%; r = 0.988), and embryonic-lethal abnormal vision, Drosophila-like 2 (ELAVL2; forward primer in exon-2, 5′-CACAGAG GACAGCAAGACCA-3′; reverse primer in exon-5, 5′-CCTCAATCCGCTTGTCA AAT-3′; efficiency 83%; r = 0.963) were designed to cross intron–exon boundaries (Beacon Designer, version 4.0; Premier Biosoft International, Palo Alto, CA). Cyclophilin-A was used as a normalization control according to our previously published protocols (Santillano et al., 2005). Thermal-stability analysis was performed to confirm the amplification of a single PCR product. RNA expression was quantified by calculating the difference between the cycle threshold of the miRNA, or mRNA of interest, and the normalization control [U6 small nuclear RNA (U6SNR) or cyclophilin-A mRNA, respectively] for each sample [Δ cycle threshold (ΔCT)], and data were expressed as 1/2ΔCT. Data that were assembled from multiple experimental plates were normalized to the mean 1/2ΔCT expression value of the independent experimental controls within each plate, (for miRNAs, expression was normalized to X¯control(12ΔCT(mRNA-U6SNR)), and for mRNAs expression was normalized to X¯control(12ΔCT(mRNA-CyclophilinA)), where X̄control = the control mean), and expressed as a percentage of the control mean. Neurosphere cultures at a density of 104 cells were transfected with 2′-O-methyl (2′OMe)-base modified miRNA antisense (Integrated DNA Technologies, Corvallis, OR) using Lipofectamine 2000 (Invitrogen). Based on a preliminary analysis, we used a concentration of 1.0 μm each antisense. This concentration was not, by itself, cytotoxic. The miRNA antisense were based on the following sequences: 2′OMe-EGFP (enhanced green fluorescent protein) nonsense control, 5′-AAGGCAAGCUGACCCUGAAGU-3′; 2′OMe-miR-21, 5′-GUCAACAUCAG UCUGAUAAGCUA-3′ [adapted from Chan et al. (2005)]; 2 ′OMe-miR-335, 5′-ACA UUUUUCGUUAUUGCUCUUGA-3′; 2 ′OMe-miR-153, 5′-GAUCACUUUUGUGACUAU GCAA-3′; and 2 ′OMe-miR-9 (conserved across all members of the miR-9 family), 5′-UCAUACAGCUAGAUAACCAAAGA-3′. Cells were collected from these cultures at 7–24 h after transfection. Flow cytometry to measure DNA content in neurosphere cultures stained with Propidium iodide (50 μg/ml; Sigma) was conducted according to previously published protocols (Cheema et al., 2004; Santillano et al., 2005). A minimum of 10,000 cells from each sample were assayed. Cells with a less than G0 DNA content were defined as apoptotic. To visualize the DNA fragmentation characteristic of apoptosis, cells were stained with DAPI (4,6,diamidino-2-phenylindole) and nuclear DNA fragmentation was visualized by fluorescent microscopy on an Olympus (Tokyo, Japan) BX60 microscope. The lactate dehydrogenase (LDH) assay to measure cytotoxicity was performed according to our previously published protocols (Cheema et al., 1999; Wade et al., 1999). Briefly, culture-conditioned medium was collected 7 h after transfection. Samples of culture medium were assayed for LDH activity using a kit (LDH assay kit; Roche, Welwyn Garden City, UK) and following the manufacturers instructions. A fluorimetric assay for the quantification of activated caspases (2, 3, 6, 7, 8, 9, and 10; homogenous caspase assay; catalog #3005372; Roche) was used to determine whether apoptosis occurred by a caspase-mediated mechanism. Independent samples containing a total of 104 cells, collected 7 h after transfection with miR-21 antisense or nonsense control, were incubated in caspase substrate at 37°C for 3 h. The cleavage of the substrate by activated caspase and the release of fluorescence was determined fluorimetrically at 521 nm using a fluorescence microplate reader (FLX800; Bio-Tek Instruments, Burlingame, CA). Changes in cell proliferation were measured using a colorimetric bromodeoxyuridine (BrdU)-based ELISA assay (Roche). Cells were exposed to BrdU, along with combinations of antisense to miRNAs of interest. Twenty-four hours after miRNA knockdown, culture medium was aspirated, and BrdU incorporation detected according to the manufacturer's protocol. Microarray-derived data were analyzed by T tests with a Benjamini and Hochberg correction for multiple comparisons, using GeneSifter (VisX Labs, Seattle, WA). All other data were analyzed using SPSS software version 13 (SPSS, Chicago, IL). miRNA expression, verified by real-time RT-PCR, was analyzed by multivariate ANOVA (MANOVA) using Pillai's trace statistic, followed by post hoc univariate ANOVA, and Fisher's least significant difference (f-LSD) test. Other data were analyzed using ANOVAs followed by post hoc f-LSD using planned comparisons, or alternatively, by Student's t tests for experiments entailing comparisons between two groups. In all cases, the α value was set at 0.05. Data were expressed as mean ± SEM or SD, as indicated in the figure legends. For the following experiments, we modeled the embryonic cerebral cortical ventricular and subventricular zones using nonadherent neurosphere cultures derived from GD12.5 mouse fetal cerebral cortical neuroepithelium and cultured in defined medium (Fig. 1a). 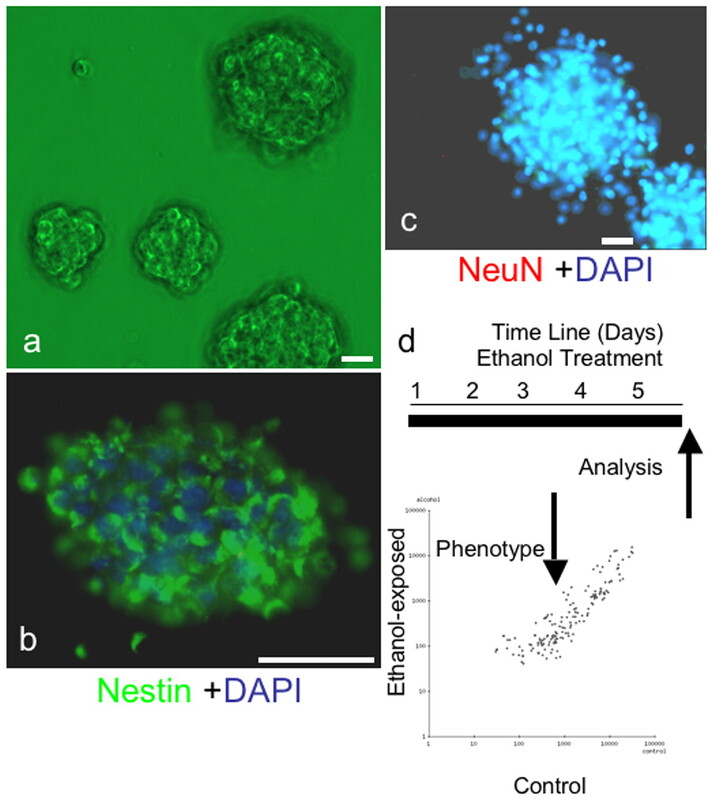 Cortical-derived neurosphere cultures express nestin (Fig. 1b), but not the neuronal nuclear antigen NeuN (Fig. 1c), indicating immaturity (Camarillo et al., 2007). Cultures were treated with control medium or with ethanol for 5 d. We used a microarray platform (Goff et al., 2005) to profile miRNA expression in neurosphere cultures, and to compare miRNA expression in control and ethanol-treated (at 320 mg/dl) cultures. This miRNA dataset has been deposited with the National Center for Biotechnology Information Gene Expression Omnibus (www.ncbi.nlm.nih.gov/geo/; accession number GPL-4229). We used a univariate, mixture-modeling algorithm (Asyali et al., 2004; Asyali and Alci, 2005) to identify miRNAs that were expressed in neurosphere cultures, and to eliminate nonexpressed miRNAs. miRNAs were categorized as being expressed if, according to the algorithm, they exceeded expression criterion in at least 80% (four of five) of the arrays. The resulting log-transformed data, containing expressed miRNAs, were analyzed using the GeneSifter suite of programs (Fig. 1d). Neural epithelial cells maintained in neurosphere cultures express ∼40% of the sampled miRNAs (84 of 218) (Fig. 2). Among these, let-7c was the miRNA that was most highly expressed by cortical neurosphere cultures, and 72% (five of seven) of the most highly expressed miRNAs belonged to the let-7 family. a, Mouse neocortical precursors isolated from GD12.5 fetal mice (see Materials and Methods) were grown as neurosphere cultures in mitogenic medium (+bFGF/+hEGF/+LIF). b, c, Neurosphere cultures are immunopositive for nestin (fluorescein, green; b). However, cultures lacked nuclear localization of NeuN (rhodamine, red; c), confirming the immaturity of neurospheres. Cell nuclei are counter-stained with DAPI (blue). d, Schematic of experimental model depicting the temporal sequence of ethanol treatment and analysis. The scatter-plot depicts miRNA expression (fluorescence intensity) in control (x-axis) and ethanol-treated (y-axis) cultures. Data points represent mean values based on five independent replicates. Scale bars, 50 μm. Histogram depicting the rank-ordered expression of miRNAs as a function of their abundance (mean microarray hybridization fluorescence intensity) in five independent control samples. Microarray data were first filtered using a univariate mixture-modeling algorithm (see Materials and Methods), to identify miRNAs that were reliably expressed in embryonic cortical neuroepithelial-derived neurosphere cultures. Filtered miRNAs were then rank ordered by their hybridization intensity. 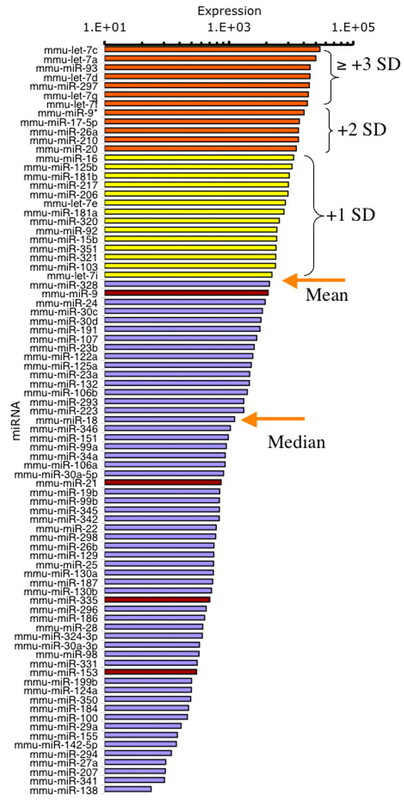 Orange arrows mark the mean and median hybridization intensities of the filtered miRNAs. The divergence between the mean and median intensity values indicates that there are a few miRNAs, from the let-7 family for example, that are highly overexpressed compared with a majority of other miRNAs. Yellow bars indicate miRNAs that are expressed at 1 SD above the mean intensity, whereas orange bars indicate expression at 2 or greater SDs above the mean intensity. Red bars denote miRNAs that were significantly suppressed by ethanol. The histogram indicates that ethanol targets the moderately expressed miRNAs, rather than the highly expressed miRNAs, in cortical neuroepithilal cells. Figure 3a lists the four miRNAs (miR-21, miR-335, miR- 9, miR-153) that were significantly regulated by a high dose of ethanol (320 mg/dl) after controlling for the false discovery rate (of a total of 23 miRNAs with a raw p value <0.05). In comparison, other miRNAs throughout the range of expression intensities (Fig. 3b) were not regulated by ethanol, indicating that ethanol did not have a global effect on miRNA expression. With the exception of miR-9, which was ranked near the mean expression level for neural-expressed miRNAs (Fig. 2), ethanol did not regulate any of the highly expressed miRNAs. Rather, ethanol targeted the moderately expressed miRNAs. Interestingly, those ethanol-sensitive miRNAs that achieved statistical significance (controlling for the false discovery rate) were all suppressed, and none were upregulated after ethanol exposure. Bar graphs depicting the expression of miRNAs in control and ethanol-exposed conditions. The x-axis depicts treatment conditions, whereas the y-axis depicts the log10 of the average signal intensity over five arrays. Data are expressed as mean ± SEM. a, Bar graphs depicting the mean intensity values of four microRNAs (miR-9, -21, -335, and -153) that were significantly suppressed by exposure to ethanol at 320 mg/dl for 5 d. Inset, Adjusted (Benjamini and Hochberg correction for multiple comparisons) p values and fold suppression of the statistically significant miRNAs. b, Sample of high to moderately expressed miRNAs that are identified as expressed in cortical neuroepithelial cells, according to microarray analysis, but not targeted by ethanol. Because our microarray data indicated that miR-21 and miR-335 were the most highly suppressed by ethanol (11- and 14-fold, respectively), we analyzed the expression of these miRNAs by real-time RT-PCR at two different time points, using two different ethanol concentrations to model two different consumption patterns (to mimic levels that are attainable among social drinkers (60 mg/dl) and among chronic alcoholics (320 mg/dl) (Adachi et al., 1991). Multivariate analysis (Pillai's Trace Statistic) of our real-time RT-PCR data (Figs. 4, 5) indicate that there was a significant main effect of treatment (F(8,94) = 6.15; p < 0.01); and an interaction effect between treatment and time (F(2,46) = 7.72; p < 0.01). post hoc univariate ANOVA indicated a significant main effect of treatment on miR-21 and miR-335 expression (F(4,47) = 3.54, p < 0.01 and F(4,47) = 9.8, p < 0.01, respectively) and a significant interaction between treatment and time (F(2,47) = 3.1, p < 0.05 and F(2,47) = 15.1, p < 0.01, respectively). At 5 d, the low dose of ethanol did not alter miR-21 expression, but the higher dose of ethanol resulted in a statistically significant (post hoc f-LSD, p < 0.01) 23-fold decline in miR-21 expression compared with controls. In contrast, the low dose of ethanol induced a statistically significant (post hoc f-LSD, p < 0.01) fourfold increase in miR-335 expression, whereas the high dose induced a statistically significant (post hoc f-LSD, p < 0.01) 38-fold decline in miR-335 expression compared with controls, consistent with the results of our microarray analyses.
. At 5 d, the 320 mg/dl dose significantly decreased miR-21 expression. Concurrent exposure to picrotoxin prevented the decrease in miR-21 induced by the high dose of ethanol 5 d with 320 mg/dl. Methanol at 320 mg/dl or 5 d also significantly decreased miR-21 expression. The inset graph indicates that picrotoxin by itself (at 100 μm for 5 d) did not induce a statistically significant change in miR-21 expression. Data were expressed as mean ± SEM. Asterisks indicate statistical significance compared with controls; p values are as indicated in the text. , normalized to the mean expression in control cultures, as in Fig. 4). Data were expressed as mean ± SEM. Asterisks indicate statistical significance compared with controls; p values are as indicated in the text. Because many effects of ethanol are thought to be attributable to modulation of the GABAA-receptor (Ma et al., 2001; Kalluri and Ticku, 2002; Abe et al., 2004), we examined whether a GABAA receptor antagonist, picrotoxin, could prevent the ethanol mediated suppression of miR-21 and miR-335. In a separate analysis, picrotoxin exposure by itself (for 5 d at 100 μm) did not induce a statistically significant change in miR-21 and miR-335 expression [t(10) = 1.16, not significant (ns) (Fig. 4, inset) and t(9) = 1.56, ns (Fig. 5, inset), respectively]. We also asked whether the effects of ethanol could be generalized to other alcohols. The overall MANOVA for these comparisons indicated a statistically significant effect (Pillai's trace statistic, F(2,35) = 17.53; p < 0.01). ANOVA indicated an overall statistically significant effect of on both miR-21 (F(3,36) = 5.86; p < 0.01) and miR-335 (F(3,36) = 4.54; p < 0.01) expression. Our data show that picrotoxin prevented the ethanol-mediated suppression of miR-21 expression (Fig. 4), but did not prevent the decline in miR-335 expression produced by concurrent ethanol exposure (Fig. 5) (post hoc f-LSD, p < 0.05 compared with controls). Furthermore, 5 d of exposure to another alcohol, methanol (at 320 mg/dl), resulted in a significant decline in miR-21 expression (Fig. 4) (post hoc f-LSD, p < 0.01 compared with controls), but not miR-335 expression (Fig. 5). Because ethanol suppressed miR-21 and miR-335 expression, we set out initially to determine the cellular phenotype that resulted from suppression of these micro-RNAs using antisense technology. One micromolar antisense suppressed miR-21 expression by ∼32-fold (Fig. 6a), whereas miR-335 exhibited up to ∼66-fold suppression (Fig. 6b), as measured by real-time PCR. Combined knockdown of miR-21 and miR-335 did not alter the efficacy of the knockdown of miR-335. a, Real-time RT-PCR illustrating significant downregulation of miR-21 after miR-21 knockdown with antisense 2′ O-methyl bases compared with control (nonsense oligonucleotide). The y-axis (expressed as 1/2ΔCT) indicates miRNA expression in cultures, normalized to U6SNR. b, Bar graph depicting miR-335 expression after either miR-335 knockdown alone, or in combination with miR-21 knockdown. miR-335 expression in the combined knockdown of miR-21 and miR-335 was similar to the expression after miR-335 knockdown alone. Data were expressed as mean ± SEM. Between 7 and 9 h after transfection, we observed significant cell death, specifically in miR-21 antisense-treated cultures. Flow cytometric analysis of DNA content showed that there was an increase in the number of cells with less than G0 DNA content within 7 h after exposure to miR-21 antisense, compared with nonsense control (Fig. 7a,b), indicating increased apoptosis in miR-21 suppressed cultures. This apoptosis was accompanied by a significant increase in the activation of caspases, as measured by a pan-caspase assay (Fig. 7c) (t(6) = 4.08; p < 0.01). Finally, miR-21 antisense, but not nonsense control, significantly increased the release of LDH into the culture medium (Fig. 7d) (t(10) = 4.6; p < 0.01), indicating that LDH release was a marker for apoptotic cell death. Because of the overlap between LDH activity and other measures of apoptosis, we used LDH activity as a measure of cell death in subsequent experiments. Frequency histograms representing flow cytometric analysis of DNA content. a, b, The x-axes represents fluorescence intensity caused by propidium iodide (PI) incorporation and the y-axes depicts cell frequency. Cultures were treated with nonsense (a) or miR-21 antisense (b) for a period of 7 h. Control, Nonsense oligonucleotide-treated cultures exhibit a peak cell frequency of PI incorporation at G0, and peaks at S-phase and G2/M, with greater than G0 PI intensity. However, a low frequency of cells are observed with less than G0 DNA content, indicative of a low level of apoptosis. In contrast, miR-21 antisense-treated cultures (a) exhibit a large peak-frequency of cells at less than G0 DNA content, indicating that a majority of cells were apoptotic. c, A pan-caspase assay measuring the activation of a combination of initiator and executioner caspases (caspases 2, 3, 6, 7, 8, 9, and 10) shows that miR-21 knockdown significantly induced the activation of caspases. The y-axis depicts a photometric [optical density (OD)] measurement of pan-caspase activity, whereas the x-axis depicts the experimental condition, transfection with nonsense control or antisense to miR-21. 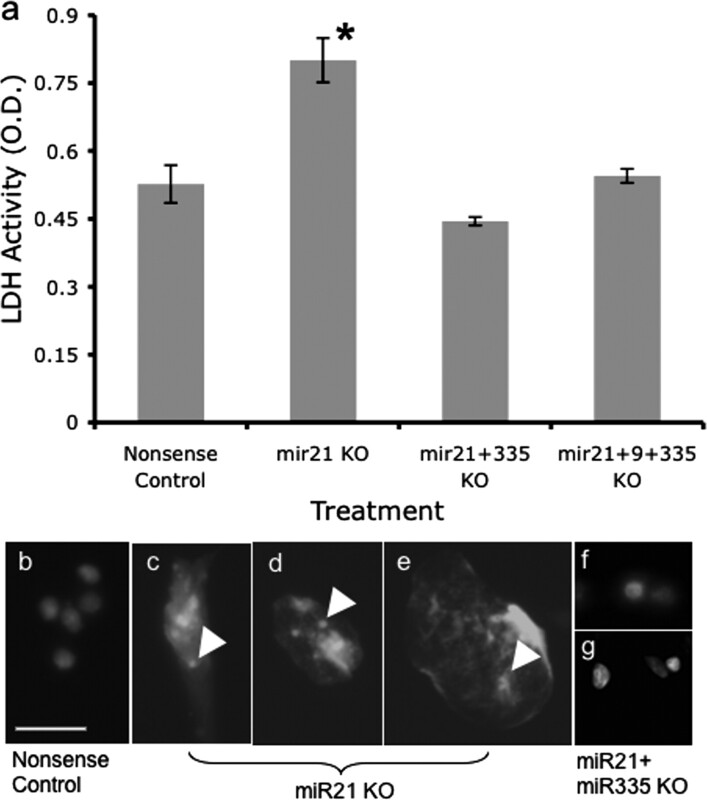 d, LDH activity was measured as an alternate index of cell death, and showed that miR-21 knockdown significantly induced LDH release into the culture medium. The y-axis depicts photometric determination (expressed in OD units) of LDH activity in culture medium, whereas the x-axis denotes the treatment condition. e, Knockdown of miR-9 and miR-335 did not significantly alter LDH release and cell death compared with nonsense control. Each experiment was based on more than six independent replicates and data are expressed as mean ± SEM. Asterisks indicate statistical significance compared with controls; p values are as indicated in the text. The proapoptotic effect of miR-21 suppression was at odds with our previous observations (Santillano et al., 2005) that ethanol did not induce apoptosis in cerebral cortical progenitors. However, because ethanol also suppressed the expression of other miRNAs, we examined the effects of suppressing miR-335, and miR-9 on cell death. Neither miR-9- nor miR-335 suppression significantly altered LDH release, compared with the nonsense control (Fig. 7e) (overall ANOVA, F(2,33) = 1.77, ns). However, cotransfection of miR-335 and miR-21 antisense significantly prevented the death caused by suppression of miR-21 (Fig. 8a) (overall ANOVA, F(3,28) = 21.16, p < 0.01; post hoc f-LSD, p < 0.01 compared with miR-21). Cotransfection of miR-9 along with miR-335 did not additionally prevent the cell death caused by miR-21 suppression. Morphological analysis of cultures stained with DAPI to visualize nuclei revealed nuclear disintegration and the presence of cytoplasmic nuclear fragments in miR-21 antisense- (Fig. 8c,d), but not nonsense control-treated (Fig. 8b) cultures. 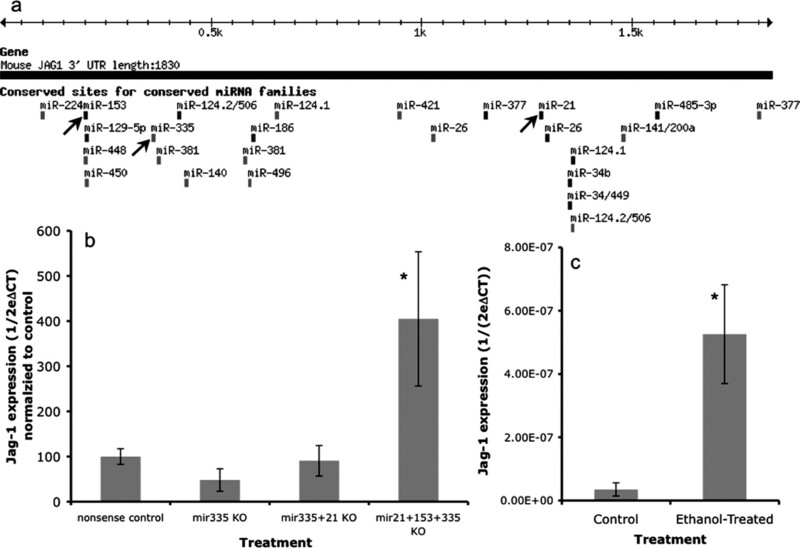 Concurrent treatment with miR-335 antisense, along with miR-21 antisense, prevented the nuclear fragmentation (Fig. 8e) observed after treatment with miR-21 antisense alone. These data suggest that the simultaneous suppression of miR-335 is the mechanism that renders neural progenitor cells resistant to death induced by miR-21 suppression. a, LDH cell death assay showed that miR-21 knockdown induced statistically significant cell death, as reported previously in Figure 7. Concurrent exposure to antisense for miR-335 or for miR-335 plus miR-9 completely prevented the cell death induced by transfection with the antisense to miR-21. Data were based on eight independent replicates and expressed as mean ± SEM. Asterisks indicate statistical significance compared with controls; p values are as indicated in the text. b, Labeling of DNA with DAPI reveals the presence of intact nuclei in nonsense controls. 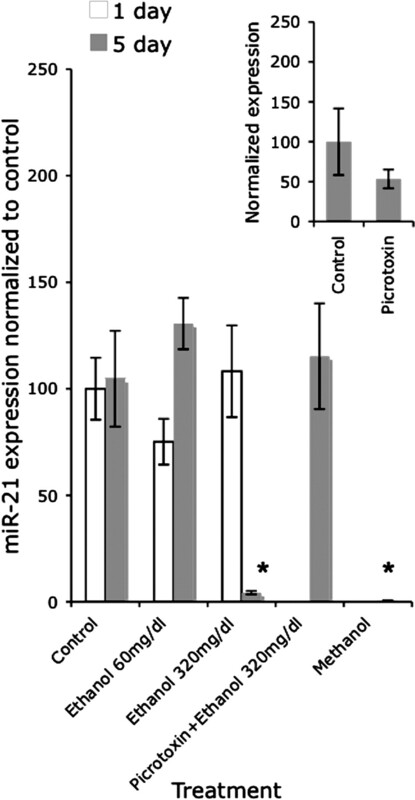 c, d, Exposure to antisense anti-miR-21 induced nuclear fragmentation. f, g, Concurrent exposure to anti-miR-335 antisense along with anti-miR-21 antisense prevented cell death induced by anti-miR-21 alone. Photomicrographs were obtained from cells fixed 7 h after transfection. Arrowheads depict the presence of nuclear DNA fragments dispersed within the cytoplasm. Scale bar: (in b) b–g, 25 μm. We observed previously that ethanol exposure increased cell proliferation in cortical neuroepithelial cells. We therefore tested whether suppressing miR-21, -335, and -9 separately, and in various combinations altered the nuclear incorporation of BrdU as a marker for cell cycle. 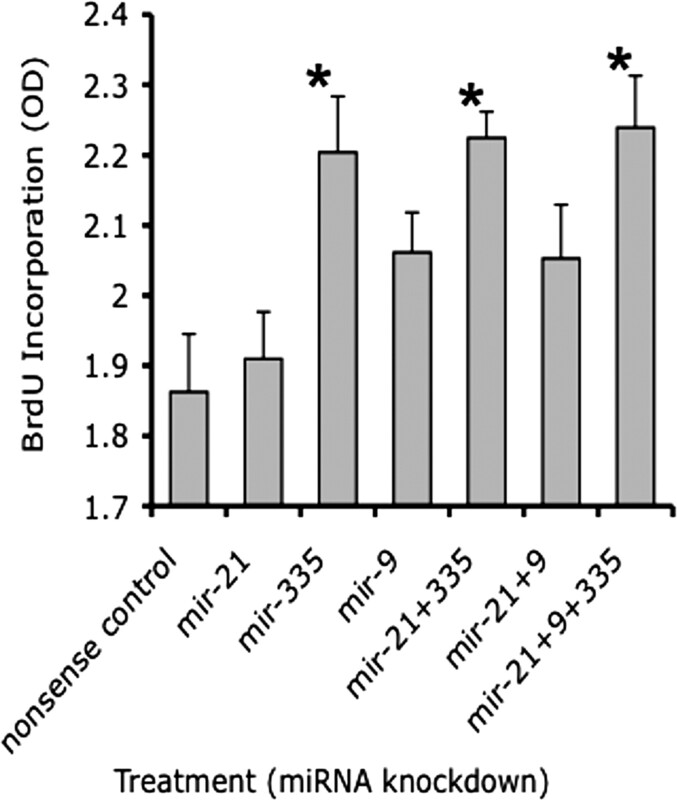 Figure 9 shows that the suppression of miR-21 and -9 by themselves did not lead to a statistically significant increase in BrdU incorporation compared with nonsense control. However, miR-335 alone or in combination with miR-21 and/or -9 induced a statistically significant increase in BrdU incorporation (overall ANOVA, F(6,28) = 4.82, p < 0.01; post hoc f-LSD, p < 0.01), indicating that miR-335 acts as an ethanol-sensitive cell-cycle regulator. BrdU incorporation was used to estimate the effect of miRNA knockdown on cell cycle. Cells were transfected with either nonsense control or various antisense anti-miRNA oligonucleotides, either alone or in combination, for a period of 24 h in the presence of culture medium containing BrdU. The y-axis depicts BrdU incorporation [in optical density (OD) units], whereas the x-axis depicts the various treatment conditions. Knockdown of miR-335 alone or in combination with miR-21 alone, or in combination with both miR-21 and miR-9, induced a significant increase in BrdU incorporation compared with nonsense controls. Data were based on six independent replicates and expressed as mean ± SEM. Asterisks indicate statistical significance; p values are as indicated in the text. We used the miRanda (Enright et al., 2003; John et al., 2004) (http://cbio.mskcc.org/), and TargetScan (version 3.1) (Lewis et al., 2003, 2005), (http://www.targetscan.org/) algorithms, to identify targets of the four ethanol-suppressed micro-RNAs. Targets identified by the miRanda algorithm were mapped using the University of California, Santa Cruz genome browser (Kent et al., 2002) (http://genome.ucsc.edu/). Computation analyses identified only two genes, Jag-1 (Jagged-1) and ELAVL2, which were targets of at least three of the four ethanol-sensitive miRNAs: miRNAs 335, 21, 153, for Jag-1 (Fig. 10a, supplemental Fig. 1, available at www.jneurosci.org as supplemental material), and miRNAs 335, 153, and 9 for ELAVL2 (supplemental Fig. 2, available at www.jneurosci.org as supplemental material). Because both computational algorithms independently identified Jag-1 as a target of ethanol-sensitive miRNAs, whereas ELAVL2 was identified only by the miRanda algorithm, and because Jag-1 was a shared target of both miR-335 and 21, our subsequent analysis focused on Jag-1.
. c, The bar graph indicates that ethanol exposure (320 mg/dl for 5 d) leads to a significant increase in Jag-1 mRNA expression. Data were expressed as mean ± SEM. Asterisks indicate statistical significance compared with controls; p values are as indicated in the text. We examined the effect of miRNA knockdown on Jag-1 mRNA expression. Real-time RT-PCR analysis (Fig. 10b) indicated that miR-335 knockdown, either alone or in combination with miR-21 did not lead to increased Jag-1 mRNA expression. However, combined knockdown of miR-335, -21, and -153 did induce a statistically significant, fourfold increase in Jag-1 mRNA expression (ANOVA, F(3,26) = 5.78, p < 0.01; post hoc f-LSD, p < 0.01). Because ethanol suppressed miR-335, -21, and -153, we predicted that ethanol would induce expression of Jag-1 mRNA. Consistent with the above hypothesis, neurosphere cultures exposed to 320 mg/dl ethanol for 5 d exhibited a significant, 15-fold increase (t(5) = 3.21; p < 0.05) (Fig. 10c) in the expression of Jag-1 mRNA. Finally, because the miRanda algorithm also identified ELAVL2 as a potential target of three ethanol-sensitive micro-RNAs, we examined whether ethanol also regulated the expression of ELAVL2 mRNA. Ethanol at 320 mg/dl for 5 d led to a significant, 2.7-fold increase (t(6) = 2.67; p < 0.05) in ELAVL2 mRNA. Teratogens often disrupt the development of multiple tissues and organs. In the case of ethanol, these include the brain, heart, and craniofacies, among others (Sulik and Johnston, 1983; Daft et al., 1986). Even within a single tissue like the brain, ethanol regulates multiple genes, serving diverse cellular processes (Gottesfeld et al., 1990; Charness et al., 1994; Freund, 1994; Cheema et al., 2000; Heaton et al., 2000; Lindsley et al., 2006). The involvement of miRNAs as intermediaries may explain some of the teratogenic pleiotropism attributed to ethanol, simply because individual miRNAs regulate the stability and translation of large numbers of mRNAs serving varied biological processes. We examined ethanol's effect on miRNAs in fetal cerebral cortical-derived neuroepithelial cells, because these cells populate the cerebral cortex with neurons and are the source of the second-trimester growth spurt in brain mass (Dobbing and Sands, 1979; Caviness, 1982; Bayer and Altman, 1995; Takahashi et al., 1999). Cerebral cortical neuroepithelial precursors expressed ∼40% of the sampled miRNAs, and these collectively constitute the miRNA signature that shapes their identity. Let-7 family members were the most highly expressed miRNAs, consistent with in vivo expression patterns reported by others (Krichevsky et al., 2003, 2006; Sempere et al., 2004), suggesting that the neurosphere culture model recapitulates critical aspects of normal brain development. Despite the importance of let-7 to embryogenesis (Hong et al., 1998; Pasquinelli and Ruvkun, 2002; Abrahante et al., 2003; Lin et al., 2003; Johnson et al., 2005), the let-7 family was not a significant ethanol target. Rather, the high dose of ethanol (320 mg/dl) suppressed moderately expressed miRNAs like miR-21, -335, -9, and -153. Such moderately expressed miRNAs preferentially suppress the expression of relatively rare mRNA transcripts (Lai, 2002; Pillai, 2005), and may shape the unique identity of the neuroepithelial transcriptome. Heavy ethanol consumption may therefore enhance the influence of rare mRNA transcripts on neuroepithelial fate by suppressing moderately expressed miRNAs. In contrast to the high ethanol dose, the lower ethanol dose (60 mg/dl) significantly increased miR-335, but not miR-21 expression. An additional implication of these studies is that low levels of ethanol consumption, attainable in social consumption settings, can also interfere with fetal development. Concurrent exposure to picrotoxin prevented ethanol suppression of miR-21 but not miR-335, suggesting that ethanol suppresses miR-21 via a GABAA receptor-dependent mechanism, whereas miR-335 was suppressed by a GABAA-independent mechanism. Other ethanol response characteristics were also miRNA-specific. Methanol, a closely related alcohol, mimicked ethanol's effect on miR-21, but not miR-335 expression. Although it is possible that miR-21 is more sensitive to methanol than miR-335, analyses of the relationship between alcohol carbon chain length and toxicity indicate that methanol and ethanol exhibit similar dose–response profiles at biochemical and behavioral levels (Thompson and de Pomerai, 2005). A more parsimonious explanation is that miR-21 expression is regulated by partition of alcohols into the lipid bilayer and interaction with hydrophobic pockets within transmembrane domains of the GABAA receptor (Wick et al., 1998; Dwyer and Bradley, 2000), whereas miR-335 is regulated by another mechanism. The GABAA independence of miR-335 is somewhat surprising because GABA, like miR-335, regulates the cell cycle in the cortical neuroepithelium (Maric et al., 2001). However, the complex proximate chromosomal environment of the miR-335 coding region may contribute to its ethanol sensitivity. miR-335 is coded within the second intron of a maternally imprinted, monoallelically expressed gene, mesoderm-specific transcript (MEST) (Lefebvre et al., 1998; Rodriguez et al., 2004). The MEST gene also codes for at least 17 alternate mRNAs (Rebhan et al., 1997) that can be transcribed from multiple transcription initiation sites, controlled by chromosome methylation at CpG islands (Nishita et al., 1999). Ethanol, because of its known ability to methylate DNA (Maier et al., 1999), may alter the complement of MEST pre-mRNA transcripts to favor those that do not include pre-miR-335. Support for this notion comes from literature showing that alternate mRNA isoforms of MEST are indeed generated when the cell cycle is deregulated (Pedersen et al., 2002), as occurs after ethanol exposure (Santillano et al., 2005). miR-21 is coded within exon 12 of the gene for transmembrane protein-49/vacuole membrane protein-1, a Golgi-trafficking protein highly expressed in brain tissue (Rebhan et al., 1997; Shmueli et al., 2003). We report that suppression of miR-21 induced apoptosis, suggesting that miR-21 is an apoptosis repressor in neuroepithelial cells, as reported by others (Chan et al., 2005; Si et al., 2006). The proapoptotic effect of suppressing miR-21 was contrary to our previous data showing that cortical neuroepithelial cells were resistant to apoptosis after ethanol exposure (Santillano et al., 2005; Prock and Miranda, 2007). However, our data show that miR-335 knockdown prevents cell death caused by suppression of miR-21. Consequently, miR-335 is a functional antagonist to miR-21, and its suppression explains the resistance to apoptosis observed in ethanol-treated neuroepithelial cells. Furthermore, miR-335 suppression increased BrdU incorporation, and this increase was not reversed by concurrent administration of miR-21 or miR-9. These data suggest that miR-335 itself is an apoptosis permissive factor, and a cell cycle suppressor. Interestingly, deletion of the paternal MEST allele leads to fetal and postnatal growth retardation (Lefebvre et al., 1998), an effect that appears to be antithetical to the function of its intronic miR-335. It is possible that fetal growth is at least partly influenced by the competing influences of MEST and its cotranscribed miR-335. As development proceeds, the brain remains one of the few tissues that continue to express high levels of MEST mRNA (Lefebvre et al., 1998). Moreover, miR-335 has also been detected on polyribosomes in maturing neurons (Kim et al., 2004), suggesting that miR-335 actively destabilizes protein translation from targeted mRNA transcripts. Therefore, the MEST/miR-335 gene locus is important for continued neuronal development in the fetal and neonatal brain. In silico analyses indicate that miR-335 potentially targets 233 different mRNAs, whereas miR-21 may target up to 109 mRNAs (John et al., 2004). Importantly, miR-21 and miR-335 are estimated to coregulate the expression of only 3 of 342 identified genes, respectively (i.e., >99% of the computationally identified genes are targeted independently by these two miRNAs). The implication of this extreme divergence in gene targets is unclear at this time. However, ethanol may provide a permissive context, which shapes cellular responses to other environmental agents. In complex, poly-teratogen environments, other agents may regulate alternate miRNAs, which nevertheless cooperate with ethanol-regulated miRNAs to further deregulate neural development. Only two mRNAs, Jag-1 and ELAVL2, were identified as candidate targets of miR-335, along with at least two of the three other ethanol-sensitive miRNAs. Jag-1 mRNA was induced only when miR-335, -21, and -153 were coordinately suppressed, suggesting that mRNA transcript stability is cooperatively regulated by multiple miRNAs, rather than by changes in any single miRNA. Jag-1, a Notch ligand, promotes the proliferation of hematopoietic stem cells (Karanu et al., 2000) and neuroepithelial cells (Nyfeler et al., 2005), and, overall, Notch signaling appears to function as a brake, to delay neuronal differentiation (Lutolf et al., 2002). Importantly, converging evidence points to the Notch pathway as both a mediator and target of ethanol's actions. For example, deletion of the mammalian neuralized homolog leads to ethanol hypersensitivity (Ruan et al., 2001). Presenslin-1 deletion results in premature neuronal differentiation and suppression of miR-9 expression (Krichevsky et al., 2003), further supporting the involvement of the Notch pathway in ethanol's actions. In contrast to Jag-1, the brain-specific RNA binding protein ELAVL2, a presumptive target of miR-335, -153, and -9, promotes neuronal maturation by binding to the 3′ untranslated regions of mRNAs to suppress non-neuronal fates and promote neuronal identity (Akamatsu et al., 1999, 2005; Yano et al., 2005; Ratti et al., 2006). Previous evidence indicates that ELAVL2 also promotes neuron-specific alternate splicing (Zhu et al., 2006) and alternate polyadenylation (Zhu et al., 2007) to expand the transcriptome repertoire of neuron specific genes. These apparently antagonistic maturational roles of two ethanol-induced genes need additional investigation. Collectively, ethanol-induced genes may mediate aberrant maturation, consistent with a previously postulated role for ethanol in the proliferation and premature maturation of cortical stem and progenitor cells (Santillano et al., 2005). Our evidence shows that a teratogen-like ethanol suppresses specific miRNAs in proliferating fetal cortical neuroepithelial precursors, and this suppression is partly GABAA-receptor dependent. Ethanol-sensitive miRNAs behave both cooperatively and as functional antagonists to shape neuroepithelial survival and growth, and the coordinate suppression of miR-21 and miR-335 explains why ethanol drives proliferation rather than death of fetal cerebral cortical precursors. These data are consistent with a previous report indicating that neural development is determined by the coordinate regulation of multiple unrelated miRNAs (Krichevsky et al., 2006). Our data further indicate that ethanol-sensitive miRNAs control important developmental genes. We do not as yet know what intervening mechanisms connect the suppression of miRNAs to cell death and the cell cycle, although it is likely that Jag-1/Notch and ELAVL2 pathways contribute to ethanol's effects on neural stem cell maturation. This work was supported by National Institutes of Health/National Institute on Alcohol Abuse and Alcoholism Grant AA13440 (R.C.M.). We thank Dr. Wei-Jung Chen for review of this manuscript, Dr. Gerald Frye for consultations and for the gift of Picrotoxin, and Drs. Cynthia Camarillo and Jane Miller for technical assistance. (2004) GABAA receptor-mediated inhibition by ethanol of long-term potentiation in the basolateral amygdala-dentate gyrus pathway in vivo. Neuroscience 125:113–117. (2003) The Caenorhabditis elegans hunchback-like gene lin-57/hbl-1 controls developmental time and is regulated by microRNAs. Dev Cell 4:625–637. (1991) Degrees of alcohol intoxication in 117 hospitalized cases. J Stud Alcohol 52:448–453. (1999) Mammalian ELAV-like neuronal RNA-binding proteins HuB and HuC promote neuronal development in both the central and the peripheral nervous systems. Proc Natl Acad Sci USA 96:9885–9890. (2005) The RNA-binding protein HuD regulates neuronal cell identity and maturation. Proc Natl Acad Sci USA 102:4625–4630. (2001) microRNAs: tiny regulators with great potential. Cell 107:823–826. (2005) Reliability analysis of microarray data using fuzzy c-means and normal mixture modeling based classification methods. Bioinformatics 21:644–649. (2004) Assessment of reliability of microarray data and estimation of signal thresholds using mixture modeling. Nucleic Acids Res 32:2323–2335. (1995) The rat nervous system, Neurogenesis and neuronal migration (Academic, San Diego), Ed 2, pp 1041–1078. (2005) Identification of hundreds of conserved and nonconserved human microRNAs, 37:766–770. (2007) Ethanol regulates angiogenic cytokines during neural development: evidence from an in vitro model of mitogen-withdrawal-induced cerebral cortical neuroepithelial differentiation. Alcohol Clin Exp Res 31:324–335. (2005) MicroRNA-21 is an antiapoptotic factor in human glioblastoma cells. Cancer Res 65:6029–6033. (1994) Ethanol inhibits neural cell–cell adhesion. J Biol Chem 269:9304–9309. (1999) Fas/Apo [apoptosis]-1 and associated proteins in the differentiating cerebral cortex: induction of caspase-dependent cell death and activation of NF-κB. J Neurosci 19:1754–1770. (2000) Ethanol induces Fas/Apo [apoptosis]-1 mRNA and cell suicide in the developing cerebral cortex. Alcohol Clin Exp Res 24:535–543. (2004) The extracellular matrix, p53 and estrogen compete to regulate cell-surface Fas/Apo-1 suicide receptor expression in proliferating embryonic cerebral cortical precursors, and reciprocally, Fas-ligand modifies estrogen control of cell-cycle proteins. BMC Neurosci 5:11. (1986) in Alcohol and brain development, Neuropathology in fetal alcohol syndrome, ed West JR (Oxford UP, New York), pp 158–166. (1978) Brain malformations related to prenatal exposure to ethanol. J Pediatr 92:64–67. (2006) Reciprocal actions of REST and a microRNA promote neuronal identity. Proc Natl Acad Sci USA 103:2422–2427. (2005) miRNAs, cancer, and stem cell division. Cell 122:6–7. (1986) Abnormal heart and great vessel development following acute ethanol exposure in mice. Teratology 33:93–104. (2003) RNAi: an ever-growing puzzle. Trends Biochem Sci 28:196–201. (1979) Comparative aspects of the brain growth spurt. Early Hum Dev 3:79–83. (2000) Chemical properties of alcohols and their protein binding sites. Cell Mol Life Sci 57:265–275. (2003) MicroRNA targets in Drosophila. Genome Biol 5:R1. (1994) Apoptosis and gene expression: perspectives on alcohol-induced brain damage. Alcohol 11:385–387. (2005) Rational probe optimization and enhanced detection strategy for microRNAs using microarrays. RNA Biol 2:093–100. (1990) Prenatal alcohol exposure alters the development of sympathetic synaptic components and of nerve growth factor receptor expression selectivity in lymphoid organs. J Neurosci Res 26:308–316. (2000) Ethanol-induced alterations in the expression of neurotrophic factors in the developing rat central nervous system. Brain Res Dev Brain Res 121:97–107. (1998) Developmental regulation of a cyclin-dependent kinase inhibitor controls postembryonic cell cycle progression in Caenorhabditis elegans. Development 125:3585–3597. (2003) Embryonic stem cell-specific microRNAs. Dev Cell 5:351–358. (2005) Real-time expression profiling of microRNA precursors in human cancer cell lines. Nucl Acids Res 33:5394–5403. (2004) Human microRNA targets. PLoS Biol 2:e363. (1975) The fetal alcohol syndrome. Teratology 12:1–10. (2002) Role of GABAA receptors in the ethanol-mediated inhibition of extracellular signal-regulated kinase. Eur J Pharmacol 451:51–54. (2000) The notch ligand jagged-1 represents a novel growth factor of human hematopoietic stem cells. J Exp Med 192:1365–1372. (2004) Identification of many microRNAs that copurify with polyribosomes in mammalian neurons. Proc Natl Acad Sci USA 101:360–365. (2005) Combinatorial microRNA target predictions, 37:495–500. (2003) A microRNA array reveals extensive regulation of microRNAs during brain development. RNA 9:1274–1281. (2006) Specific microRNAs modulate embryonic stem cell-derived neurogenesis. Stem Cells 24:857–864. (2002) Micro RNAs are complementary to 3′ UTR sequence motifs that mediate negative post-transcriptional regulation, 30:363–364. (1998) Abnormal maternal behaviour and growth retardation associated with loss of the imprinted gene Mest. Nat Genet 20:163–169. (2003) Prediction of mammalian microRNA targets. Cell 115:787–798. (2005) Microarray analysis shows that some microRNAs downregulate large numbers of target mRNAs, 433:769–773. (2003) The C. elegans hunchback homolog, hbl-1, controls temporal patterning and is a probable microRNA target. Dev Cell 4:639–650. (2006) Signaling pathways regulating cell motility: a role in ethanol teratogenicity? Alcohol Clin Exp Res 30:1445–1450. (2005) Identifying fetal alcohol spectrum disorder in primary care. CMAJ 172:628–630. (2001) Ethanol blocks cytosolic Ca2+ responses triggered by activation of GABAA receptor/Cl− channels in cultured proliferating rat neuroepithelial cells. Neuroscience 104:913–922. (1999) Alcohol exposure during the first two trimesters equivalent alters granule cell number and neurotrophin expression in the developing rat olfactory bulb. J Neurobiol 41:414–423. (2001) GABA expression dominates neuronal lineage progression in the embryonic rat neocortex and facilitates neurite outgrowth via GABAA autoreceptor/Cl− channels. J Neurosci 21:2343–2360. (1999) Effect of CpG methylation on expression of the mouse imprinted gene Mest. Gene 226:199–209. (2005) Jagged1 signals in the postnatal subventricular zone are required for neural stem cell self-renewal. EMBO J 24:3504–3515. (2004) Requirement for neurogenesis to proceed through the division of neuronal progenitors following differentiation of epidermal growth factor and fibroblast growth factor-2-responsive human neural stem cells. Stem Cells 22:798–811. (1999) Changing properties of GABAA receptor-mediated signaling during early neocortical development. J Neurophysiol 82:570–583. (2006) Functional properties of neurons derived from fetal mouse neurospheres are compatible with those of neuronal precursors in vivo. J Neurosci Res 83:1494–1501. (2002) Control of developmental timing by microRNAs and their targets. Annual Rev Cell Dev Biol 18:495–513. (2002) Promoter switch: a novel mechanism causing biallelic PEG1/MEST expression in invasive breast cancer. Hum Mol Genet 11:1449–1453. (2006) The aryl hydrocarbon receptor pathway and sexual differentiation of neuroendocrine functions. Endocrinology 147:S33–S42. (2005) MicroRNA function: multiple mechanisms for a tiny RNA? RNA 11:1753–1761. (2007) Embryonic cerebral cortical progenitors are resistant to apoptosis, but increase expression of suicide receptor DISC-complex genes and suppress autophagy following ethanol exposure. Alcohol Clin Exp Res 31:694–703. (2006) A role for the ELAV RNA-binding proteins in neural stem cells: stabilization of Msi1 mRNA. J Cell Sci 119:1442–1452. (1997) GeneCards: encyclopedia for genes, proteins and diseases (Weizmann Institute of Science, Bioinformatics Unit and Genome Center, Rehovot, Israel) Retrieved July 23, 2007 from http://www.genecards.org/. (2005) Fetal alcohol spectrum disorders: an overview with emphasis on changes in brain and behavior. Exp Biol Med (Maywood) 230:357–365. (2004) Identification of mammalian microRNA host genes and transcription units. Genome Res 14:1902–1910. (2001) Ethanol hypersensitivity and olfactory discrimination defect in mice lacking a homolog of Drosophila neuralized. Proc Natl Acad Sci USA 98:9907–9912. (2005) Ethanol induces cell-cycle activity and reduces stem cell diversity to alter both regenerative capacity and differentiation potential of cerebral cortical neuroepithelial precursors. BMC Neurosci 6:59. (2004) A high-throughput method to monitor the expression of microRNA precursors. Nucl Acids Res 32:e43-. (2004) Expression profiling of mammalian microRNAs uncovers a subset of brain-expressed microRNAs with possible roles in murine and human neuronal differentiation. Genome Biol 5:R13. (2003) GeneNote: whole genome expression profiles in normal human tissues. C R Biol 326:1067–1072. (2003) Fetal alcohol spectrum disorder. JAMA 290:2996–2999. (2000) Neuropsychiatric implications and long-term consequences of fetal alcohol spectrum disorders. Semin Clin Neuropsychiatry 5:177–190. (1983) Sequence of developmental alterations following acute ethanol exposure in mice: Craniofacial features of the fetal alcohol syndrome. Am J Anat 166:257–269. (1999) Sequence of neuron origin and neocortical laminar fate: relation to cell cycle of origin in the developing murine cerebral wall. J Neurosci 19:10357–10371. (2005) Toxicity of short-chain alcohols to the nematode Caenorhabditis elegans: a comparison of endpoints. J Biochem Mol Toxicol 19:87–95. (1999) Overlapping and divergent actions of estrogen and the neurogrophins on cell fate and p-53 dependent signal transduction in conditionally immortalized cerebral cortical neuroblasts. J Neurosci 15:6994–7006. (1999) Prenatal teratogens and the development of adult mental illness. Dev Psychopathol 11:457–466. (1998) Mutations of gamma-aminobutyric acid and glycine receptors change alcohol cutoff: evidence for an alcohol receptor? Proc Natl Acad Sci USA 95:6504–6509. (2004) Convergent effects on cell signaling mechanisms mediate the actions of different neurobehavioral teratogens: alterations in cholinergic regulation of protein kinase C in chick and avian models. Ann NY Acad Sci 1025:595–601. (2005) Involvement of Hu and heterogeneous nuclear ribonucleoprotein K in neuronal differentiation through p21 mRNA post-transcriptional regulation. J Biol Chem 280:12690–12699. (2002) In vitro analysis of the origin, migratory behavior, and maturation of cortical pyramidal cells. J Comp Neurol 454:1–14. (2006) A nuclear function of Hu proteins as neuron-specific alternative RNA processing regulators. Mol Biol Cell 17:5105–5114. (2007) Hu proteins regulate polyadenylation by blocking sites containing U-rich sequences. J Biol Chem 282:2203–2210.